Ever since the financial crisis, there has been a huge fascination with predictions of the next “big crash” right around the next corner. Whether it is Greece, Italy, Chinese debt, the “overvalued” stock market, the Shiller Ratio, Puerto Rico, underfunded pensions in Illinois and New Jersey, the Fed (both for QE a few years ago and now for removing QE), rising interest rates, Federal budget deficits, peaking profit margins, etc, the list of reasons for the market to fall seems to grow longer and longer by the day. Because of this, investors, including individuals, institutions, hedge funds, etc, have lower exposures to stocks than in past periods of time. Various strategists at major investment banks regularly predict a downturn more wicked than the financial crisis. In essence, if you want to sell newsletters, newspapers, research, or get clicks for web stories, all you have to do is create a prediction of the next major downturn and find some reason, such as sun flares, zodiac signs, or trouble in Portugal, and you have revenue. What is wrong with being cautious and prudent? It is in vogue for institutions and individuals, whether large or small, to allocate away from stocks. For example, Yale today has roughly 4% of its assets in US stocks, a large family we spoke with a while back had roughly $40 million of their $12 billion fortune in stocks, or well under 1%, and advisors regularly tell us that their clients, by and large, would prefer little exposure to stocks, if any. Whatever exposure they have, “cut it” is their instruction. Quite frankly, this fear of equities has affected active equity managers’ ability to raise capital, including ours. Who wants to hire a manager to, oh the horror, buy stocks? The result of all of this bearishness is that domestic equity funds, including actively managed, index funds and ETF’s, have seen significant outflows since 2007. Sources: ICI and FRED. Flows into EFT’s, Mutual Funds, Money Market Funds and Deposits. As the table above shows, US equities took in $1.7 Trillion of new assets from 1993 to 2006, the year prior to the financial crisis. However, from 2007 to 2017, equities saw $253 Billion of outflows, despite the huge growth of ETF’s and mutual funds that index to equity benchmarks. 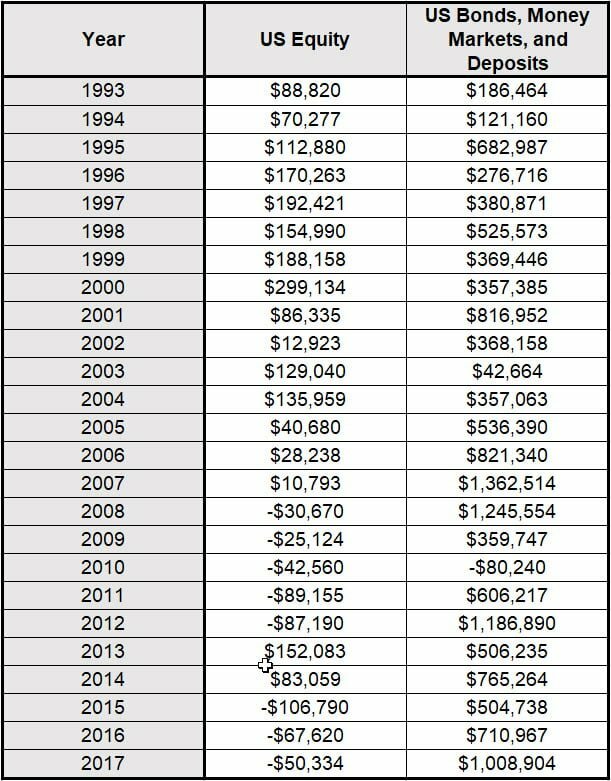 Thus, investors, in aggregate, remain quite cautious as roughly 91% of all savings flowed into nearly riskless assets over this 25 year period of time. Amazingly, over the last 12 years, more than 100% of all flows were directed toward assets that, in aggregate, had almost zero net returns. Thus, the asset class that has experienced the highest returns since the financial crisis, US stocks, has not seen a dime of net investment over the last dozen years while $8 Trillion went into the financial equivalent of the mattress. We believe a similar story exists for institutional capital based upon articles, conversations, asset allocation reports, manager searches, etc. Today’s mattress type of investments are cool; stocks are uncool. Some will say that this cannot be true. How, then, is the stock market higher, they ask? Corporate buybacks, which are running at a $1 Trillion annual rate this year, are the driving force. Many value companies find their shares compelling and are buying back those shares at a record pace. Makes perfect sense to us, especially since our portfolio is trading at slightly over 9 times forward earnings estimates. Thus, our holdings are earning an average 11% cash on cash rate of return with dollars used for stock buybacks. The return grows further as the companies we hold grow roughly 6% annually and reduce their share count, thus spreading the earnings, dividends and cash flow over fewer and fewer owners. Seems like no brainer to us. Most importantly, the Fund has compounded an initial $1 invested at inception into $4.10, net of fees, vs the $3.07 for the S&P 500, gross of fees, and $1.70 for the HFRI Value Index. Further, the Fund has paid out a net negative amount of capital gains since its inception so the returns shown above were not partially taxed away, at either income or capital gain rates, for our largely taxable client base. Much of our competition trades very frequently so the returns they generate are largely taxed as income.Roughly 50% of the value of the Fund today is made up of unrealized capital gains. We hope that this number grows exponentially: taxes paid far in the future are much better than taxes paid today because compounding the deferred tax liability indefinitely adds to our partners’ wealth. Our top ten holdings, in order of size, are Walgreens, Citigroup, the Tesla short, NMI Holdings, Barclays, Viacom, Honda, State Street, CVS and McKesson. We believe that our long positions are extremely attractive at roughly 9 times forward estimated earnings. This is at or below the lowest P/E the Fund has traded at since we started it 8 years ago and is well below any valuation level that the mutual fund I used to manage traded at. Thus, unless the laws of finance are somehow being repealed, the future should be quite bright because buy low, sell high works. The drama with Tesla will hopefully be over in coming months and years. We maintain that the company is in deep trouble, due to too much debt, too little cash, too many losses, too much spending on capital expenditures, too high labor costs in the Bay Area, too many finance employees quitting, too many defects, too few repair centers, too many lawsuits, too much incoming competition, too few remaining tax credits, and too many ethical issues that regulators will eventually find. It is only a matter of time before the walls come closing in on the company, regardless of the quantity of cars they sell this quarter or next. Honda made and sold about 1.3 million cars and 5.3 million motorcycles last quarter. Tesla made and sold about 83,000 cars. And we [the market] are supposed to be impressed? Tesla, despite its recent drop, still commands a far larger valuation than Honda when one takes into account Honda’s $18 billion in cash and Tesla’s $10 billion in debt. What makes it more absurd is that Honda earned over $9 billion last year while Tesla lost $2 billion. The pressure on Tesla has not come from critics, as the CEO laments, but rather from overly enthralled investors in the company’s stock. The shares have been driven to ludicrous levels by management statements designed to create excitement and hope that the planet will survive for our descendants because of the company’s activities. Living up to these massive expectations is really, really hard to do. When management teams realize that it is impossible, they start acting weird by pushing boundaries and stretching the truth. Seems to describe the current situation pretty well. We think that the cheapest shares in the market will experience a material upward re-rating, leading to attractive returns for our partners. In general, we believe that our long positions, on a weighted average basis, could return 150% over the next five years, due to the combination of dividends, share repurchases, growth in earnings, and multiple expansion. Further, we are hopeful that our short positions could add 30-40% to the Fund’s value over this time frame. Thus, our best guess is that the Fund could compound $1 today into $3 over the next five years, assuming that our estimates of dividends, earnings growth and multiple expansion are accurate. According to a recent CNBC article that sources SentimenTrader, there are three times more shares hitting 52-week lows than 52 week highs. This is the highest this ratio has been since December of 1999, after which the fund I managed previously had the best two years of equity performance in my career as it rose 50%, net of fees, while the S&P 500 fell 20%, both over the 2000-2001 period of time. The setup is quite similar: The Fed is raising interest rates, value shares are left for dead, and the darlings are trading at enormous valuations that leave zero room for error. In fact, we would argue that the public and private darlings, in aggregate, are priced at such a high level that they will need to overtake expected GDP a decade from now to provide decent returns for shareholders. Will everyone eventually work for Amazon? Why are we so bullish? Are we just reckless? Aren’t we seeing what everyone else sees and getting out of the way? Many investors seem to think that those who own stocks this far into an economic expansion and bull market are either taking too much risk, not that bright, under-educated, or some combination of the three. From our perspective, however, we think that the market is ignoring $20 bills laying all over the ground because the common wisdom is that picking them up is excessively risky. In our experience, stocks at 9 times earnings with attractive long-term growth rates, dividends and share repurchases are not risky. Avoiding them in the name of being prudent seems to be what is foolish and, dare we say, reckless. 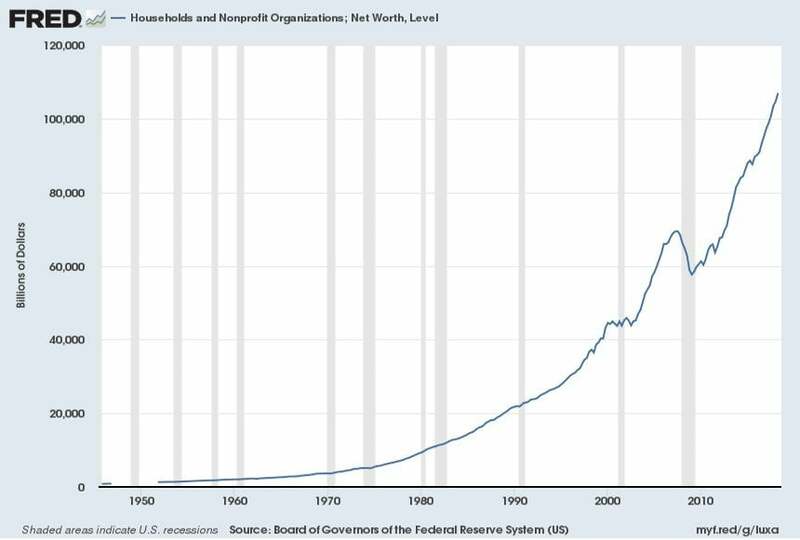 As you can see, household net worth is up roughly $40 Trillion, or about 80%, from its level prior to the Financial Crisis. People spend when they have money in their accounts, which is sometimes called the wealth effect. Further, the unemployment rate, at 3.7%, is near a 50-year low and wage growth is starting to accelerate. 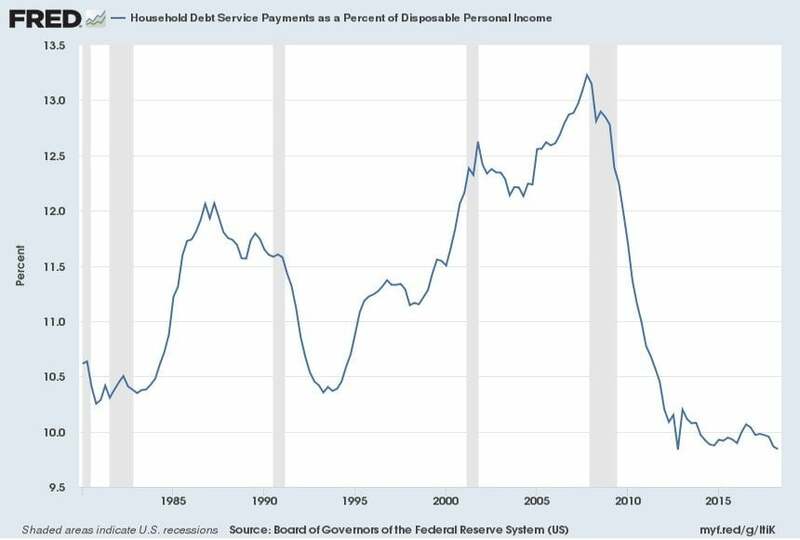 And finally, the consumer’s debt to income ratio, defined as fixed payments as a percentage of income, is below past recessionary lows, not near bubble highs. Bottom line: the consumer is in fantastic shape. Those who profess to see a recession led bear market are, unfortunately for their clients and families, just plain wrong. Because of the trauma resulting from the financial crisis, consumers have not taken on debt nor invested in equities, as they normally would, which should extend this relatively anemic expansion far longer. Over the last 40 years, the US has never entered a recession with consumer debt-to-income ratios this low. Are there overvalued stocks and sectors? Absolutely, but we can avoid or, if extreme, short those. Concurrently, the value parts of the stock market will accelerate and confound those who are positioned against it. Sitting in cash, or under one’s desk, in the name of prudence is ignoring the facts that consumers are healthy, many stocks are cheap, equity ownership creates wealth significantly above inflation, and trying to time the market is a fool’s errand.